Are you looking for the best beginner guitar? The guitar is one of the best instruments to learn, because it's fun and because many tunes can be played, from classical to modern music. How do you choose a beginners guitar? Buying a beginner guitar can be quite a difficult task. There are many factors to consider. A good guitar must make a clean, booming sound. In order for the sound to be good, the choice of wood is important. That’s why you need to consider the type of wood that the guitar is made of (woods can be: mahogany, maple, rosewood). Other factors to consider when choosing the best beginner guitar include the different necks, the bridges, the scale length, the body type. If you are looking for a decent acoustic guitar, we recommend that you don’t go for something that is too cheap or you won’t get a guitar that produces a good sound. Furthermore, it will be difficult to learn anything with a cheap guitar. Cheap, low quality guitars are actually hard to learn on. They are made of low quality materials and they don’t produce a good sound. Their strings don’t stay in tune making playing the instrument very difficult. Playing with a cheap guitar can actually be really frustrating. Comes with a pick, bag and ebook. We have selected a few guitars that are great sounding, easy to play and great value for the money. 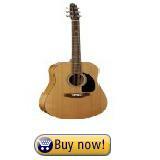 The first guitar that we recommend is the 38" COFFEE acoustic guitar. It’s the only very cheap guitar that we recommend because it produces a good sound especially considering the price. It is a good choice for children who are starting to learn the instrument. Another thing that we like about this package is that it comes with a pick, a gig bag and an ebook. Contains tuner and lesson DVD. Another guitar that we recommend is the Yamaha FG700S. Many guitar players would agree that Yamaha makes among the best beginners guitars. Yamaha guitars need little set up work (unlike really cheap guitars). Another great aspect of Yamaha guitars is that they come into packages with accessories including a tuner to tune the strings and a lesson DVD. Made of cedar and mahogany wood. Another acoustic guitar that we recommend is the Seagull S6. It is more expensive and of higher grade than the Yamaha guitar. It is Canadian made, it makes a beautiful sound thanks to its cedar and mahogany wood. And overall it is really excellent value for money. Now, what music to play on that new beginner guitar? How about some free guitar music of all levels? Check out Music-for-Music-Teachers.com, for great free beginner guitar tabs and sheetmusic!